Unfortunately, the cold and flu season has arrived, and many people are simply not prepared to deal with it. Apathy and ignorance often go hand in hand, and the next thing you know the entire office staff has been infected with a nasty flu bug because patient zero didn’t think it was necessary to practice proper hygiene after going to the bathroom! 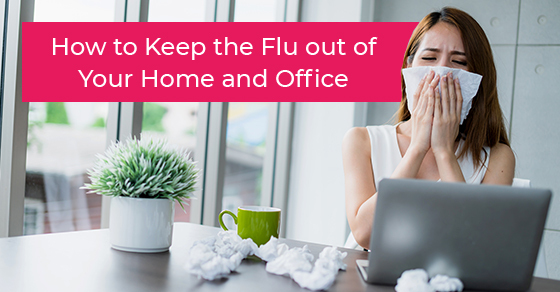 Regardless of the reason, there are many things that you can do to help keep the flu bug at bay, whether you are at home or at the office. For starters, your kitchen and bathroom should be fully stocked with paper towels and soap containers. Your kitchen’s sponge should also be replaced periodically, especially if it is an office kitchen. By having a clean sponge, your co-workers will reduce the likelihood that they will spread germs in and around the office. Moreover, at least 2 of your employees or co-workers should have access to the extra supplies. Also, at least one female and one male employee should have access to the extra supplies, so that they can restock the supplies in the bathroom for their respective gender. The general rule of thumb is to prepare for anything, especially when many people work and mingle together in close proximity. If you fail to stock up on the essentials then there is a good chance that you will run out of the essentials when you need them most. Failure to have the essentials on hand will mean your employees or family members will be forced to practice inadequate cleaning practices, which will significantly increase the risk of germs spreading. Also, if your office is infamous for running out of paper towels or soap midday then you can mitigate the problem by simply installing a few extra fixtures in the bathroom. Hand sanitizers have gotten a bad rap in certain circles, but they do actually have merit when it comes to reducing the spread of germs. In fact, using hand sanitizer products at least five times a day has been shown to reduce the risk of spreading flu germs around the home and office. Considering the number of home and office surfaces that are touched every day, using a hand sanitizer frequently throughout the day will ensure that hands remain clean when they touch multiple surfaces at home or at the office. You can provide your co-workers or employees with a small bottle of hand sanitizer that they can keep on their person or at their desk, and you should also install hand sanitizer dispensers in the office bathroom and kitchen as well. Furthermore, it may be beneficial to also install one at the reception desk so that visitors can also make use of some hand sanitizer product should they need it. Arguably the best way to keep a home or office clean is to hire a cleaning company that is known for its superb cleaning services. In the event that you don’t currently have a cleaning company working for you then you can easily find one at an affordable price with a little bit of research. To begin, call or email multiple local cleaning companies at your earliest convenience. Don’t forget to ask each company for an estimate or quote as well, and then compare and contrast to determine the best fit for your budget. Next, you can further narrow down your search by asking each prospective cleaning company how they go about sterilizing or disinfecting an office space. In other words, ask them what techniques and what actual products they use in order to properly disinfect an office. In reality, disinfecting products do not work instantly. Instead, they need to sit for a few minutes before being scrubbed off. As such, ask each company what disinfecting practices they implement, and if you are not satisfied with the answers that they provide then it is time to bid them adieu and move to the next prospect. Finally, you should also contact references for each company that you are considering hiring. Never, under any circumstances, should you sign a service contract until you are fully satisfied with the references that they provide. After you have hired a cleaning company you should do your part by cleaning your home every day. A daily cleaning regimen can help keep your home in pristine condition, which may also inspire your family members to do the same and practice impeccable hygiene. If you are in need of quality cleaning services in Mississauga then we can help. Sunrise Cleaning provides quality cleaning services in Mississauga. We also offer a 20% discount on the first cleaning and are a full-service cleaning company that places the needs of our clients above the bottom line. Locally owned and operated, we have nearly 20 years of experience in the residential and commercial cleaning industry and take great pride in the numerous awards and accolades that we have received over the years, including our A+ rating by the Better Business Bureau. To learn more about our quality cleaning services in Mississauga or to request a quote, please call us at 289-814-1824 or visit our website.